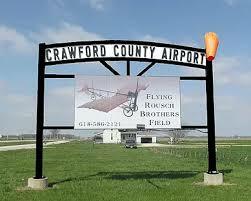 The Crawford County Airport Authority will be hosting the first ever Flying Rousch Brothers Field “Wings by the Wabash” Airshow 2018 at the Crawford County Airport. The event will take place September 22 & 23, 2018. A special meet and greet with the performers will be held on Friday, September 21. Eric Edgren, a farmer by trade and has flown over 150 different aircraft, will fly his “T-Clips” in a Comedy/Aerobatic act. Nathan Hammond will also be performing in the “Ghostwriter.” He will be writing in the sky over the county Thursday-Sunday, with each letter being approximately one mile tall. An opening flag ceremony will be performed by the “Misty Blues,” an all ladies skydiving team. They have performed at many airshows and will be offering a Tandem jump with a very luck sponsor! Special guests, “Ladies For Liberty,” a singing troupe dedicated to performing great music from the 1940s, the Andrews Sisters style. These talented ladies have performed at many airshows as well as Military and Veteran events all over the world. The Commemorative Airforce will be offering rides to anyone interested in seeing a TBM Avenger (World War 2 torpedo bomber) and Aerocona L3 (World War 2 Liaison airplane). The Airshow will have displays of planes on the airport ramp and food and vendors will also be set up. An aviation theme tent for kids and a bounce house will available as well.